I had hoped to like this book more. After all, the blurbs on its back cover from Nobel Laureate Amartya Sen, Former Labor Secretary Robert Reich, Columbia University economist Jeffrey Sachs, and environmentalist Bill McKibben, all sing its praises. My own view is more mixed, however. First, let me outline what I liked about the book. The author, University of California-Berkeley economist Clair Brown, correctly diagnoses our society’s greatest errors and failings: its fostering of obscene levels of economic inequality, its despoliation of the planet, its single-minded focus on generating wealth rather than on expanding human well-being and flourishing, and its economic model of corporate obligations to shareholders but not stakeholders. Dr. Brown offers many sensible alternatives and solutions to these problems, providing reasonable guidelines for reducing wealth inequality, putting the global economy on a sustainable footing, preserving the planet, and maximizing human happiness and potential. If we followed the author’s exhortations, I have no doubt that our world would be a much better place. I would very much like to live in the world she prescribes. Now for the things I didn’t like about the book. First, to my mind, the title doesn’t make any sense. 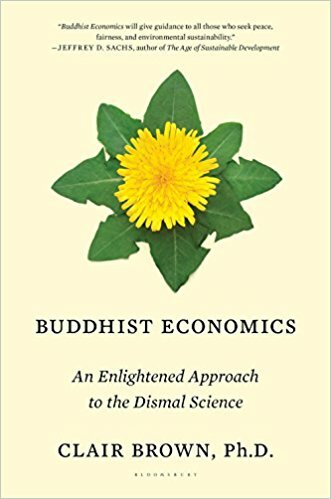 There is no such thing as “Buddhist Economics,” just as there is no such thing as Buddhist Astrophysics or Buddhist Quantum Mechanics. Economics is economics, plain and simple. It’s a social science that tells us how to get from point A to point B: Here’s what one ought to do if one wants to constrain inflation; Here’s what one ought do if one wants full employment; and so on. It tells us the correct means to reach desired goals. What it doesn’t do is tell us what our goals ought to be. That field—the one that tells us what we ought to desire—is ethics rather than economics. What Clair Brown is really arguing for is not a better economics, but a better ethics. She is suggesting a different set of human goals to aim at, rather than a different type of means to get there. In the end, what Clair Brown fails to do is give us a road map that would tell us how to reorder American politics so that sensible economic proposals, such as the one she is making, can be given a chance. We can guess what some of those political changes would involve—an end to Citizen’s United, an end to gerrymandering, genuine election finance reform, and so on. But how is one to accomplish those things? Today, the kind of transvaluation of values that would be needed before meaningful political change could occur seems farther off than ever. That is what those of us on the “religious left” toil for with little hope and against heavy odds. It’s easy to think up solutions to most of our problems. The problem is, they never live to see the light of day. To sum up, if you’re interested in suggestions for how to reorder our economic system so that businesses are more socially responsible, so that everyone is guaranteed a living wage, so that our economy is carbon neutral, so that the gap between rich and poor nations is reduced, and so that developing human potential and well-being are more important than growing economic productivity, then this is an excellent book. If you, like me, happen to be a Buddhist modernist, you will find much that you like and agree with. I am one of those who happen to think our economy ought to be constrained by the emerging universalist humanist modernist ethics, which we as Buddhist modernists share with modernists of other faiths. The problem is, we still need a roadmap of how to draw those who view things differently into the conversation. I suspect there are no shortcuts, that the road will be hard, that there will be many defeats along the way, and that there is no guarantee of either eventual success or planetary survival.